We start in the coffin room. Gus Nichols, head of Nichols Funeral Directors, is giving us a tour of their premises on Lombard Street. He thinks it would be an interesting place to start, and he’s right. There aren’t many times in life when you get the chance to walk into a coffin-room. It’s small, about twice the size of a garden shed, and stacks of wooden coffins line the walls like bunk beds. One has what looks like a copy of Da Vinci’s Last Supper carved into the side. In the corner there’s a wicker coffin, which are apparently becoming increasingly popular. Wicker is more environmentally friendly, but Nichols insists that most people choose it because it simply looks fashionable. As he leads us outside, he tells us disdainfully that he has “no interest” in coffins; they’re not what it’s about. Nichols Funeral Directors have been active in Dublin since 1814. The word undertaker is nowhere on their literature or website, but Nichols uses the terms undertaker and funeral director interchangeably. He is the sixth Nichols to take over the family business. When they turned 200 years old in 2014, they published a book about their history with a foreword by David Norris. At the beginning of the fifth episode of Ulysses (Lotus-Eaters), Leopold Bloom walked “past Nichols’ the undertaker’s”. They manage about 2,300 funerals a year, about eight or nine a day, dealing in every single one of them with customers – we may as well call them customers – who, in Nichols’ words, “expect only the best service they’ve ever had”. About sixty or seventy things need to go right at a funeral, and it is the funeral directors who manage everything, from hospital bed to grave. When someone dies, they are the first people you call. Nichols describes the work as “rapid, instantaneous”, like “a solicitor’s with a furniture business”. The work-life balance is poor; there is always someone in need of a funeral. It’s obvious that Nichols is a man used to working fast and keeping a lot of things in his head at the same time. He likes examples and quick answers; there is no talking around the point. When I ask him, out of curiosity, whether the recession affected his business, he immediately nods and zeroes in on flowers. “Before the recession people would have spent, say, €150 on flowers; that dropped to about €50 overnight.” As he shows us around the funeral home, I ask him if he advertises. They do, mostly on Rip.ie, but he tells me that back before the internet they used to spend “a fortune” on Golden Pages. Nichols had never intended to get into the family business. He studied in Trinity and then travelled, living in London and Hong Kong, but wound up taking over the business when he was 25, after the sudden death of his father, Edward. More than once, he makes it clear that there is no way he would be a funeral director otherwise. And they wouldn’t normally hire younger people anyway; they prefer “someone who’s been around the block a few times”. A more hard-hearted person in his job might be able to speak about it more casually, but Nichols avoids the gravity of the whole thing as it clearly affects him. He shrugs when I ask him if he fears death. “Well, yeah. I have no secrets,” he insists. Just as some families busy themselves at funerals to cope with grief, the intensely logical side of him is clearly in part a reaction to the kind of work he does. Nichols readily admits this himself; he speaks about “your professional hat,” and always uses the second-person singular when talking about the harder parts of the job. “The mentality,” he says, “is similar to that of a doctor or nurse, or any A&E professional: that you’re going to see some real s**t throughout the day, and if you can’t cut it, don’t be there. But some funerals you never get used to: heartache, tragedies, children, murders, suicides, car accidents – and if that doesn’t affect you, you shouldn’t be there either.” Just as good doctors make bad patients, undertakers are particularly bad at dealing with bereavements. “You’re thrown by it,” he says, “that affects you”. 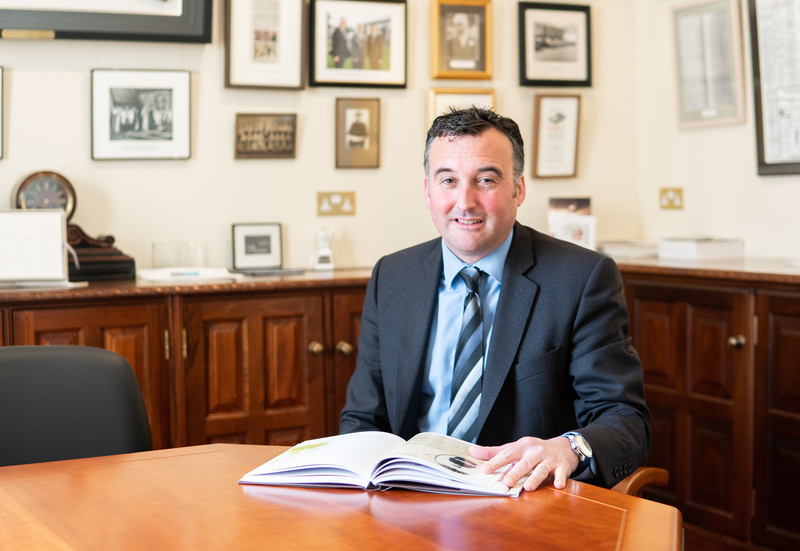 But the hardest thing about being a funeral director – or at least the hardest-sounding – is that even if you get used to the work, over time the funerals get harder. At first, he says, “you’re burying your friends’ grandparents, and then as you get older it starts to be their parents, and then you start burying your friends”. Eventually, everyone needs a funeral director. Throughout the book Nichols produced for their bicentenary, there are instances of multiple generations of the same family whom they have buried. In 2013, Nichols organised the funeral of the son of a retired soldier, in a small cemetery in Phoenix Park. He had also organised the last burial at the cemetery in 1998 – that of the soldier himself. “We do it pretty well here,” Nichols says when I ask him which country does funerals best. Gus travelled around for two years as President of the World Organisation of Funeral Operatives (FIAT-IFTA). He mentions China, where all funerals are managed by one state organisation that organises nine million funerals a year. In 2010, he went to Shanghai’s funeral centre, where they look after 250 families a day. “The place was bigger than St. Vincent’s Hospital,” he said. With meals being an important part of Chinese funeral culture, on one side there was a 35-storey restaurant, with each floor offering a different price-range. “Genetics” is Nichols’ quick answer when I ask him how he got into the business, but it’s apparent the real answer is tradition. Eventually, everyone needs an undertaker; and when they do, they want to know who they are. One part of Nichols’ job is simply to be the Nichols, the same people who have been burying the same families for centuries. But however strong they may be, traditions do change, as often as societies change. In 1814, horses and carriages were a significant part of the Nichols’ daily grind, but no more; today many once indispensable aspects of Irish funeral culture are being consigned to history, with no clear replacement. In Nichols’ words, people know that they don’t want an old-fashioned Catholic funeral, “but they don’t know what they want”. In those circumstances – when people expect the undertaker to tell them what to do – Nichols usually direct them towards a civil service and cremation. About 40% of Nichols’ funerals are now cremations; only one in 10 involve a removal. This being the case, one wonders for how long the tradition that supports the Nichols is sustainable. It is one thing in 1814, but as funerals become cremations and rituals shrink in length from days to half-hours – as we remove death from our lives – the space for the community undertaker is getting smaller. At 25, Gus Nichols reluctantly turned away from another path in life and became the sixth generation of Nichols. Who knows if the seventh or eighth will do the same? For Nichols, and for society as a whole, that is the challenge of this century: how to turn death into renewal. At the front of their funeral home on Lombard Street, the quote from Ulysses is there in gold letters. Funeral director might not be anyone’s dream job, but we would lose something if all tradition was drained from the undertaker’s role and funerals became things to be gotten over as quickly as possible. Ultimately, removal or not, we all will have some kind of relationship with death. Whether it is a healthy one is our choice. We can bureaucratise and sequester the whole thing like China; or we can talk about it openly, and try to find a place for it in our lives.